Maintain constant and stable temperatures for your aquatic creatures to thrive with AquaTop’s GH-200W aquarium heater. This analog glass heater offers simple and easy installation with the use of the included suction cups and can handle aquariums up to 50 gallons. With the highly visible temperature setting, the GH-200W is easy to set and adjust to the desired temperature with the use of the Temperature Adjustment Knob. This powerful heater also has double insulation and is made from high quality insulated glass. I live in a small town without a fish store. I love this internet store. They have a friendly website, good prices, and wonderful products. The turn dial can come off if you're not careful. Then you have to recailibrate the heater. Overall the best bang for your buck. 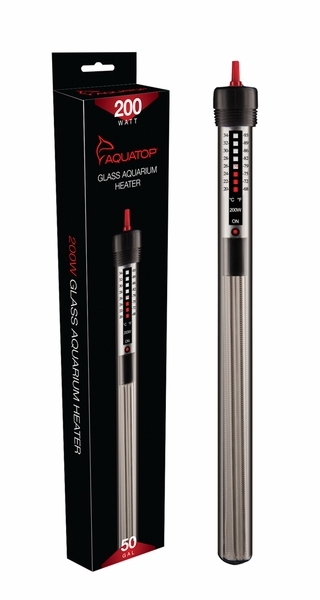 I've owned 4 analog submersible heaters from Aquatop, and all of them have performed great. Speedy shipment. Excellent value. No complaints. using this in a spare tank - heats up incredibly fast, fairly accurate calibrated temp knob to set temp. We keep our house at 60 degress and i wanted a good heater that could handle a 25 gallon aquarium and this heater does an excellent job. Ordering was easy and item arrived in perfect condition. The product was shipped quickly and packaged well. It is easy to use and for the price a great deal. It is accurate and keeps the aquarium at a constant temp and with the temp settings visible was very easy to set the desired temperature. I would definitely purchase my next heater from them and highly recommend them.